Transmitters are used in various process industries to measure pressure, temperature, and levels of fluid (liquid, and gases). These transmitters can be extremely expensive, especially if you are buying new ones from well-known brands. If you wish to use high-quality transmitters, without paying high prices, consider buying reconditioned ones. Many users are still reluctant to invest in reconditioned transmitters, due to various confusions. This post discusses answers all those questions, which you may have in mind regarding reconditioned transmitters. 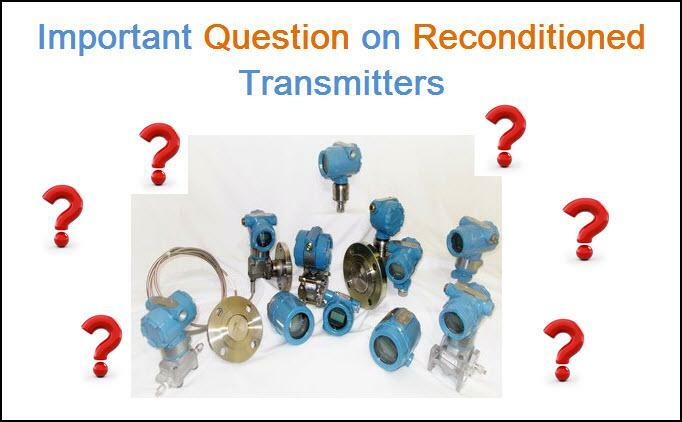 The following questions will help you understand why reconditioned transmitters might be a good choice for your process industry. What is a reconditioned transmitter? Ans. Many times, transmitters are returned to the OEM due to minor cosmetic defects. These transmitters undergo rigorous testing, and inspection, and are restored to original factory specifications. As, these tools are returned to the manufacturer, they cannot be marketed as new. This offers immense benefits to the customer. Here’s why, the transmitter undergo stringent tests to ensure that they are working efficiently. Generally, factory standards are high, and every reconditioned tool passes strenuous tests before meeting the final approval. Thus, consumers are receiving reconditioned tools, which cost 30-50% less than their newer counterparts. What is the difference between remanufactured and reconditioned transmitters? Ans. Many times, remanufacturing and reconditioning are interchanged due to confusions. However, both differ in their approach. In reconditioned transmitter, only damaged parts are changed. However, the remanufactured transmitter will have several many new parts, which are reassembled after thorough testing. Do reconditioned transmitters offer a better value? Ans. Yes. Reconditioned transmitters definitely offer a better value for investment. They are like a new transmitter, with a 1-year warranty at an affordable price tag. What if reconditioned transmitters stop functioning? Ans. As mentioned before, most reconditioned transmitters are offered with a 1-year warranty. Thus, you can always approach a supplier with a service request. Thus, the transmitter will be fully tested again, and returned with better working parts. Who typically purchases a reconditioned transmitter? Ans. Reconditioned transmitters are always ideal for process industries that aim to optimize their operational budgets. The reasonable pricing on these reconditioned transmitters helps users to justify buying a quality product that is required to get the job done. There is nothing like using a high-quality tool in the factory. How would I ensure that reconditioned transmitter meets quality requirements? Ans. If you are purchasing these equipment from a reliable suppliers, there are all chances that you will receive quality control, as well as a 5 point calibration sheet with the product. This certifies that each transmitter has been retested and certified to a customer specification or manufacturer range. Hopefully, you have got answers to all your queries. It is very important that you source your reconditioned transmitters from a reliable supplier. The Transmitter Shop, abbreviated as TTS, is the leading supplier of reconditioned transmitters. The company offers pressure, temperature, level, wireless, and multivariable transmitters from brands like Rosemount, Foxboro, Honeywell, and Fisher.